Were you able to guess the year and location of today’s vintage transit photo? Pictured is a Lindell Railway double-truck streetcar with lifeguard trays at each end and protective gating at the sides to cut down on highway injuries. 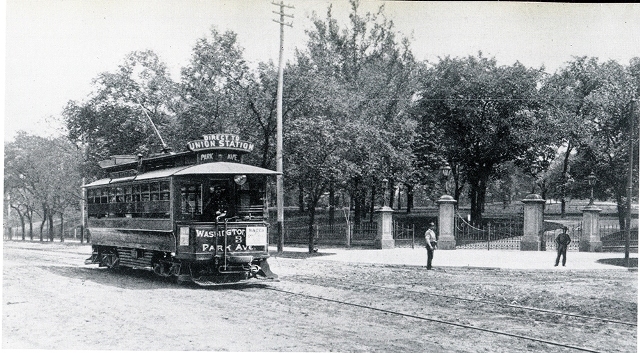 Car #3 is seen here going north on Mississippi Avenue at Park Avenue, Lafayette Park in 1896. That was the year that the Great Cyclone of 1896 tore through this neighborhood. This photo must have been taken before May 27 of that year because the trees would likely have been felled.